Don’t spend thousands of dollars on dental implants and be unsatisfied. Dental Implant retained lower dentures can be a great solution for denture wearers. There is one problem; they are incomplete without lower denture stabilizers. Implants secure the front of the denture but what about the back? What holds the rear of the denture down to prevent the denture from lifting and allowing food and debris to get under the denture and irritate your gums? Stabil-Dent Lower Denture Stabilizers solve the common and frustrating problem of lower denture lift. Our simple, patented design allows the tongue to provide downward pressure on the stabilizers, this in turn keeps the rear of the denture from lifting up. Don’t let debris getting under your implant retained denture make you uncomfortable and unhappy. Simply add Stabil-Dent Lower Denture stabilizers and enjoy their benefits. As to a standard denture, Stabil-Dent will provide the most benefits with an implant retained lower that has an extended sublingual area. Please see our “Why Stabil-Dent” page for more information. Those on a budget, such as seniors, may not be able to afford the sky rocketing costs of dental implant retained dentures. Others may not want to go through the invasive and painful procedure required for dental implants or take the chance of implant failures. Stabil-Dent lower denture stabilizers give consumers an affordable option to dental implants. 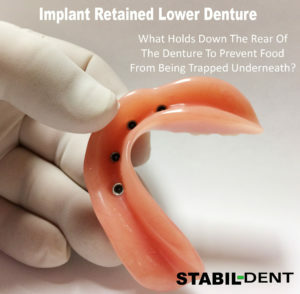 By simply adding Stabil-Dent Lower Denture Stabilizers to a standard lower denture you can get the stabilized feeling of implant retained dentures for a fraction of the cost of dental implants. Simply add them to your lower denture in the comfort of your own home at the time of your choosing. Click here to see how lower denture stabilizers work.